﻿ E-ink-Reader. The review of electronic books SONY READER. Electronic books SONY have won for a long time the European market thanks to high quality of assemblage and the stable software. Models PRS-300, PRS-350 and PRS-600 are executed in the thin stylish metal case. Model SONY PRS-300 - is the first model of the electronic book from SONY. It can be got till now in some shops. The book has five-inch VIZPLEX screen. Except the basic navigating keys are located under the display, on the right side of the case there are a numeric keys for a menu selection or the book from a bookshelf. Approximately in the middle of the electronic book on the right there is very confortable lever for browsing.The book has no slot for a SD-flash card. Loading of books occurs only for internal memory of the reader through an USB-cable. 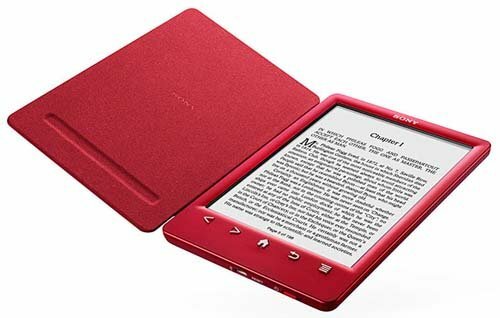 Model SONY PRS-350 - the following updating of the electronic book with five-inch screen. He has touch display of last updating type of E-ink Pearl. Lateral keys have disappeared as superfluous. Slot for a SD-card at this model on former is not present, but the volume of internal memory of the device has increased. And the bookshelf became more interesting. There was a mode of viewing of books / files with display of their covers. Model SONY PRS-600 - device with 6 inch touch screen E-ink Pearl and slot for a SD-card. Functionally it is very similar on SONY PRS-350 , but the bookshelf is less functional. Sony PRS-T1 now it is laid off, but for change to it there is a model SONY PRS-T2.The design of the reader is a little changed. In the list of supported formats has appeared FB2, from applications were added Facebook and Evernote. New SONY PRS-T3 became almost for 15 mm shorter, slightly thicker and 36 grams heavier than the PRS-T2. Location of the keys, design, features and battery life are remained almost unchanged. The main advantage of the model is the cover attached to the housing and using of the screen E-ink Pearl HD (758x1024 pixels). First book from SONY is sold with bookcover. In the delivery of PRS-T3 for Russia there is supporting of format FB2, built-in English-Russian dictionary Oxford Russian Dictionary, the application for work with the social network Facebook. Advantages of a design and equipment: The good screen, the strong, thin metal case, Japanese quality and reliability. Design and equipment flaws:Poor equipment. The power unit and a bookcover are got separately (except for the PRS-T3). Advantages of the software: Simplicity and reliability, fonts with a anti-aliasing mode. Software flaws: Only few supported text formats (FB2 - it is not supported), are not present support of folders on a flash card (all books which have been spread out on folders, appear on a book shelf one heap). Incomplete russification - is not present Russian carryings over. Is not present functions downloading TTF-fonts. The majority of lacks of the software of these models can be eliminated installation of a foreign update with the program for reading of text, how to make it is written here: Alternative firmware. Selection of resources of the Internet about Sony Reader is in section "Links."